What can happen if people stop sharing their frustration? What are the consequences of not revealing the pains and frustrations that might kill us from inside? A post-traumatic syndrome disorder (PTSD) is a serious problem that must be taken care of immediately. Unfortunately, immediate help never comes quickly enough. Yet, there is one group of people who need it the most – the war veterans. “Thank You for Your Service” inspired by true events and based on the book by David Finkel, follows a group of U.S. soldiers who try to find their ground after returning home from Iraq. As they struggle to integrate into civilian life, they realize it is hard to leave behind what they’ve witnessed during the war, that’s stuck in their minds. Each of them has his own path to go through. Yet, in the end, they will learn one thing – they may not be able to change the bureaucracy but they own fate is in their hands and they can change it any way they want. That they really need, is the decision to move on. In most cases, though, it is easier to say than do, especially for those, who have to live with PTSD for the rest of their lives. 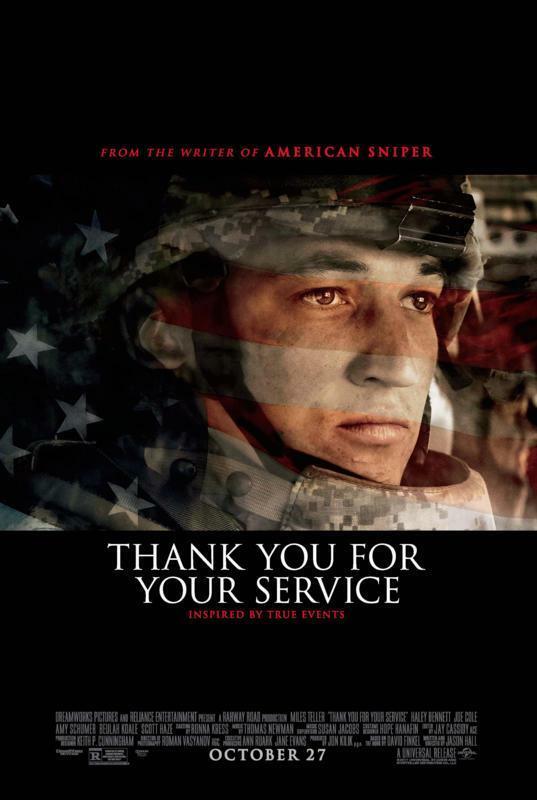 The film opens with a scene of Adam Schumann (Miles Teller) being ambushed during a mission in Iraq. Sergeant Emory gets injured in his head, and Adam has to react quickly and carry him to safety. Halfway on the run, exhausted, Adam drops him, making his injury even worse. Afterward, we see Adam, Will, and Solo on their way home. They talk about the life that is waiting for them. Will is the most impatient, as he is waiting to see his wife and beloved daughter. Upon stepping on their homeland soil, though, everything turns out different from what they expected. While Adam’s wife Saskia (Haley Bennett) celebrates her husband’s return, Will received a different welcome. He finds his house empty, the furniture gone, no electricity and absolutely no clues about his wife’s whereabouts. The feeling of loneliness and being deceived by the person he loved, Will finds no other solution than a bullet to take his own life. This tragedy is a life-changing turning point for Adam and Solo (Beulah Koale), who admit that they have an issue. There is so much going on in their minds – despair, isolation, frustration, and anger. All of this forces them to make poor decisions. Still, there is one thing they can trust will never fail them – the strong bond of brotherhood between them. They will never abandon each other, no matter what. In conclusion, Jason Hall’s “Thank You for Your Service” is an emotionally heavy film to watch. At some point, the viewer starts living the life of war veterans and feel their pain. Yet, we know we are powerless in our desire to help them. We are only passive observers of the struggle going on the silver screen. The film becomes more and more dramatic, creating a blend of the American Dream with three important elements drama, psychological struggle, and family matters. All of this is, of course, spiced up with the solid performance delivered by the entire cast. Having said that, Hall’s piece is not an average film about war. It is not about the victory or killing one’s enemies. In this film, we meet the most powerful enemy every soldier has to face after the war – their fears of the outcomes of the war. Anyone, who has ever seen war, will understand and appreciate it.